First of all, Nigeria is destined to lead the world for human and universal transformation and this is the accurate revelation to activate the actualization of the divine mandate in the 21st Century unto the next phase of life. 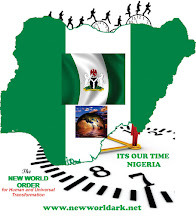 Therefore, Nigeria shall arise but Nigerians must arise first with the power of God. Good day to you whoever you are, whatever you are or have achieved and wherever you may be. The peace and grace of God be with you and your family in the Name of Jesus Christ, the resurrected Lord of heaven and earth, Amen. I, Ijigban Daniel Oketa am a messenger of God and this message is to all peace loving people Nigeria specifically and around the world. I am sent to make an announcement and do not represent any particular church or people under heaven but in the Unity of the Faith and in the love of God and mankind. Surely this message is more important than my name or my location. Posterity with judge you based on how you respond to this messages and whether you act on it or not, the day will come and nothing shall stop it. But know that by this, the deliverance of your family, community or country has been put in your hands. "Watch and surely the day is coming; it will burn like a furnace. All the arrogant and every evildoer will be stubble, and that day that is coming will set them on fire," says the Lord Almighty. "Not a root or a branch will be left to them. But for you who fear or revere my name, the sun of righteousness will rise with healing in its wings upon you. And you will go out and leap like calves released from the stall. Then you will trample down the wicked; they will be ashes under the soles of your feet on the day when I do these things," says the Lord Almighty. “And in that day you people should ask me all things. Verily, verily, I say unto you, Whatsoever you and all those who serve me shall ask the Father in my name, he will give you. Beloved, it is not a joke and it does not demand anything from you but only to offer yourself in prayer of the Time Redemption principle for you to see the glory and manifestation of God. 1. On that night, specifically and very importantly, evil plans, groups and their sponsors in and outside of governments or positions of authority who refuse to repent and confess before that day shall be judged with the fire of God. Whether they are called Boko haram or whatever name or type of evil they perpetrate- they shall not escape. 5. There shall be great grace and power to the righteous. 6. It is a day of judgment and Justice of God. 7. That night/day is the Crossover night; that is on the 31st December 2018- to the 1st Day of January 2019. It shall be a new beginning for Nigeria and for many people- but it carries a unique responsibility which is the Time Redemption Prayer. · On that night from your location (home, church, work etc); wherever you may be, please be awake and don’t be asleep for any reasons and by 11pm, 12midnight, 1am and 12noon, you should plead the Blood of Jesus Christ at least seven (7) times. For example BLOOD OF JESUS CHRIST, BLOOD OF JESUS CHRIST, BLOOD OF JESUS CHRIST in union and unity and then plead the Blood on Nigeria, yourself, city/land/State, and on the date/day. For I cover myself (Ijigban Daniel) with the BLOOD OF JESUS CHRIST seven times. · Beloved, on that night, you may sing, clap/dance, speak in tongues for as much as you want or preferably study the word of God but it is most important to use the Blood by the top of the hours (11pm, 12am, 1am) and later by the day at 12noon. DON'T MISS THIS DAY, PLEASE and please I beg you. · Everyone is implicated who needs the intervention of God in his or her life, family or community and country. · There shall be diverse numerous miracles and Interventions of God in you and in your favour. 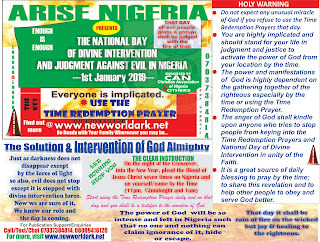 Whatever you seek of God shall be miraculously given to you on that day and from that day forward while Everyone sponsoring evil in Nigeria shall suffer convulsion publicly unto destruction be them boko haram and their camps, herdsmen militias, ritual killers, evil pastors or liars against God; armed robbers/thieves and looters, terrorists, rapists, slave masters, witches and wizards, necromancers, evil leaders and killers of Nigerians etc no matter how sophisticated they claim to be or have been. You will need to read/listen to this message again and again to get acquainted with these instructions. But let me tell you more about the judgment and justice of God. From that day forward, the world ill fear God and respect Nigeria and Nigerians. Using the Time Redemption Prayer secret of God is to stand for the judgment and justice of God. 1. In numbers chapter twenty five, there was a man (Phinehas, the grandson of Aaron) who stood in Judgment for God-and this is what God said of him: ‘Phinehas, the son of Eleazar, the son of Aaron the priest, was zealous for my sake among them. Wherefore I say, Behold, I give unto him my covenant of peace: And he shall have it, and his seed after him, even the covenant of an everlasting priesthood; because he was zealous for his God, and made an atonement for the children of Israel.” Beloved you need to stand in Judgment that day for evil to be judged and destroyed. 2. In the Book of the Psalms One hundred and forty nine, God says it is a great privilege to the saints or those called of God to stand in judgment using the principle of the Time Redemption (i.e from their rooms) to execute vengeance upon the heathen, and punishments upon the people; To bind their kings with chains, and their nobles with fetters of iron’. Hence, it a privilege for anyone to connect to the National Day of Divine Intervention and Judgment Against Evil in Nigeria. STAND FOR YOUR LIFE- GET PREPARED DAILY. 2. To seek Gods favour and intervention in your life and family. 3. To connect to the greatness of the time. Therefore, let everyone be awake and involved in this- using the Time Redemption Prayers. In a plan to deceive you or to deceive themselves against this, some people may say- ‘oh let God do whatever He pleases and let the evil planners continue but at the end the counsel of the Lord shall stand’. Yes beloved, the counsel of the Lord shall stand but don’t forget that the counsel of the Lord is the instruction of God to you and those who believe to obey. And it is those who obey that are set free or justified- so wake of to this reality now. 1. Imagine if the Israelites refused to buy a lamb or refused to use the Blood on their lintel; Imagine if they took Moses for granted; or imagine that they bought the lamb, killed and eat it but refused to use the Blood on the lintel of their houses according to the instruction of a simple Moses without title. Beloved, the truth is that that appointed date will come but they would have perished with the others or continue to stay in slavery for another may be 30years extra after the already 400 and may be another additional 30 years (430years) which would have been 460years. 2. Also, imagine if the people of Israel claimed to know too much than ordinary Joshua without a title of Apostle/prophet and they refused to go round the city of Jericho seven times or refused to shout seven times because it sounds foolish. The fact is that Jericho wall would have stood- and they would keep wasting their time until they obey the instruction and counsel of God through Joshua. 3. 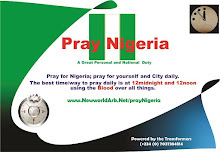 God needs you and everyone- small or big to obey or use the principle of the Time Redemption prayers on that day- It is not a matter of one person or group- Nigeria is large so it needs the good number of people who believe to obey this to see the miracles of God. The fact is that the grace of God on ground that day is a generational grace and should not be missed by anyone. Meanwhile it is holy that defaulter shall not partake in the greatness of God displayed on that day and may find it hard to connect. So if you want the counsel of God to stand against evil in Nigeria, then obey God by using the Time Redemption. The power of God will be so intense and felt in Nigeria such that no one and nothing can claim ignorance of it, hide or escape from it. So everyone is implicated. But do not expect any great or unusual miracle with you or your family if you refused to obey or use. God says curse be the one who does the work of God deceitfully and refused to stand in judgment for God- Jeremiah 48:10. 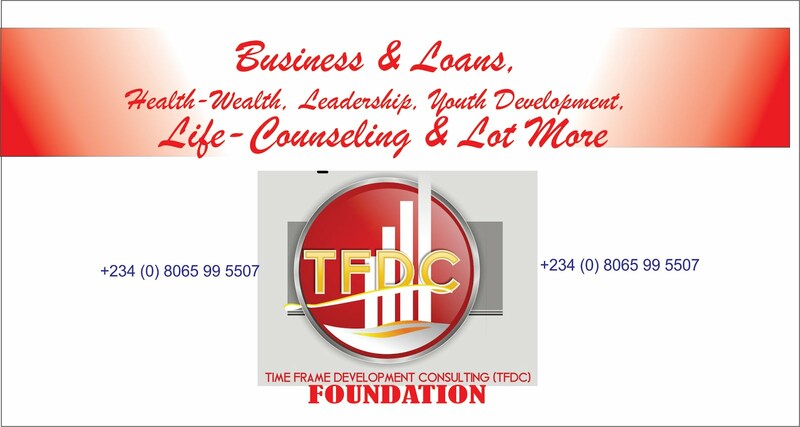 Don’t be like the Aid de Camp of King Ahab who did not believe Prophet Elisha. He saw the day of abundance but died thereon- he never partook. That shall not be your portion. Just as darkness does not disappear except by the force of light so also evil does not stop except it is stopped with divine intervention force of faith works. Now we are sure of work of faith- the Time Redemption Prayer; we know our role and the day and it is coming. Without this, all kinds of evil and much complaining will prevail in Nigeria and environs. 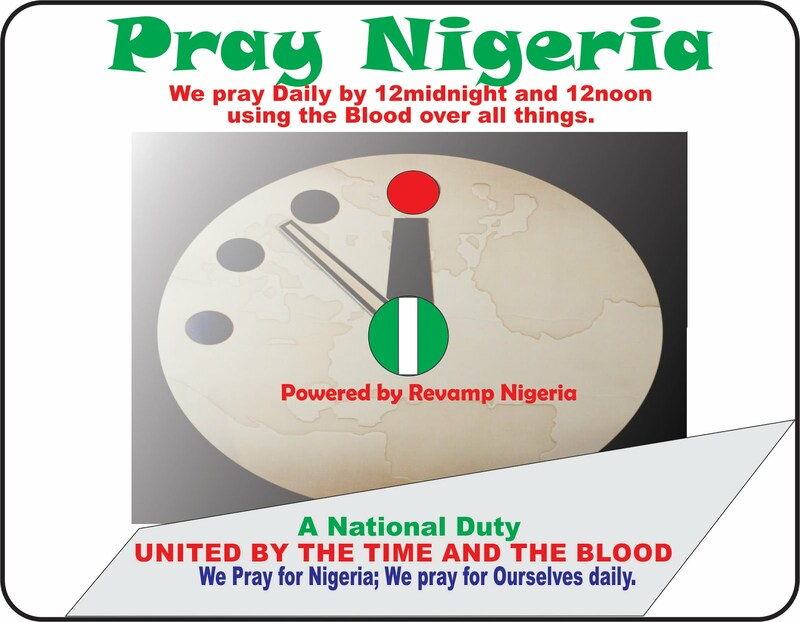 Nigeria is on a state of emergency and this is the only way revealed by God for the triumph over evil through effective prayers using the Time Redemption Prayer. 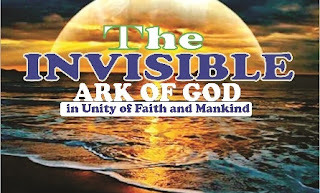 It is the gathering to God for the extraordinarily supernatural. 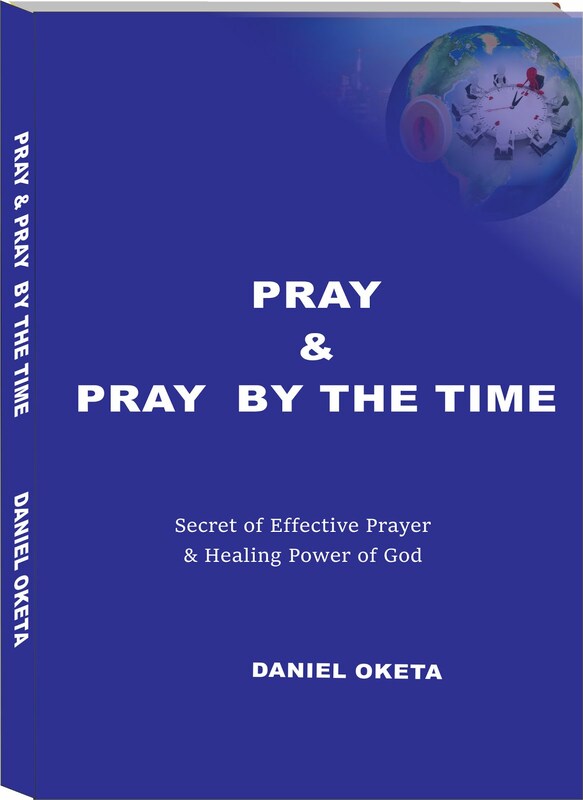 that you and your family + Church needs to do is to connect with this great work and miracle of God using the Time Redemption Prayers daily and more importantly on THAT DAY. There is a great plan of evil by the enemies of Nigeria and the enemies of good people; they have planned to organize a religious cleansing on the day and no gun stock piling or gun running and no government policy/security apparatus can stop them because they have been over taken already and over powered. Some of the missiles have already be fixed in worship places, game centers, relaxation joints etc where they believe that many people will be gathering on that Day for what is generally known and crossover, or New Year Day’s celebration. Other forms of missiles will be shut from distances places even outside the country on various targets and there is currently to technology (Intercontinental Ballistic Missiles Defense System) to stop them. They don’t need to come to your location physically. The truth is that nothing under heaven can hinder or destroy this plan or diffused the implanted harmful substances and expose those behind it in a disgusting shame of collusion/epilepsy/stroke except by the power of God against these evil planers and machines activated by the gathering of people from their various locations in the Time Redemption Prayer. It is the secret of God revealed to man for the activation of divine intervention and judgment of God against evil. This is why the gathering unto God in the Unity of the Time Redemption prayers from very home on that day is very important and you and your family shall not miss it for any reason felt, seen or imagined. Beloved, this is not about another country by Nigeria- says the Lord and that you should be the generational and global leaders from Nigeria to the world in the glory that is to begin on that day. 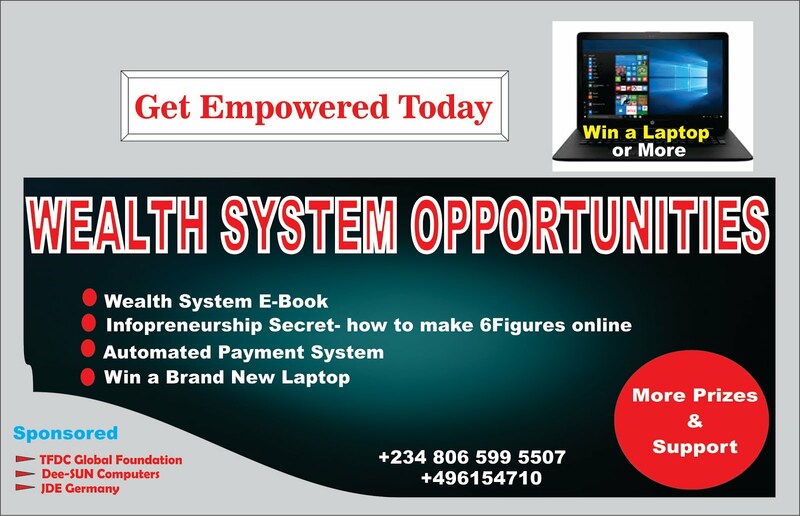 That is why we shall there is going to be political and economic revolution with human and transformation in Nigeria. 1. You shall know whom to vote into the various offices in the 2019 general election for after this day; because some of them whose hands are soil in blood of the innocent shall be judge with fire to wreckage. 3. On the parallel market, the Naira will hit the global market with great value and began to be measured in equivalent to leading currencies. 4. The wisdom of God shall abound in Nigeria as the water covers the sea. 5. 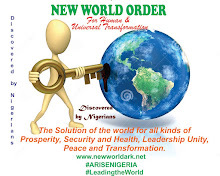 Nigeria will begin to take her proper position in global leadership and it the comity of nations. She shall be home to many nations. That day will greatly shape the 2019 General Election because we will search for the evil doers and we shall not see them anymore. This is by the mercy of God- not by power and not by might but by the grace of God being revealed and no one can stop it. I need you to give heed and due diligence to God’s instruction by the day and time appointed. 1. God created time as the first element and used it to create other elements including man. 2. God says gave man 120 before this present world to repent or prepare for the translation. 3. God says Israel shall be in captivity for 400years although they spent 430 for lack of preparedness or the absent of a deliverer. 4. God needed 10years at least to save Sodom and Gomorra He could not find. 5. God about 2-3 times or days, 40 days etc..
All the above represents times and number for effectiveness of divine power and success on earth. Beloved am telling you these things about numbers because, you are part of the number that God needs to intervene powerfully in Nigeria. And 2019 is the year while 1st January is the day. Let it not be missed for lack of understanding and unbelief. And really it is not for the benefit of God but for your own benefit. Beloved, I beg to wake up to this power of God. 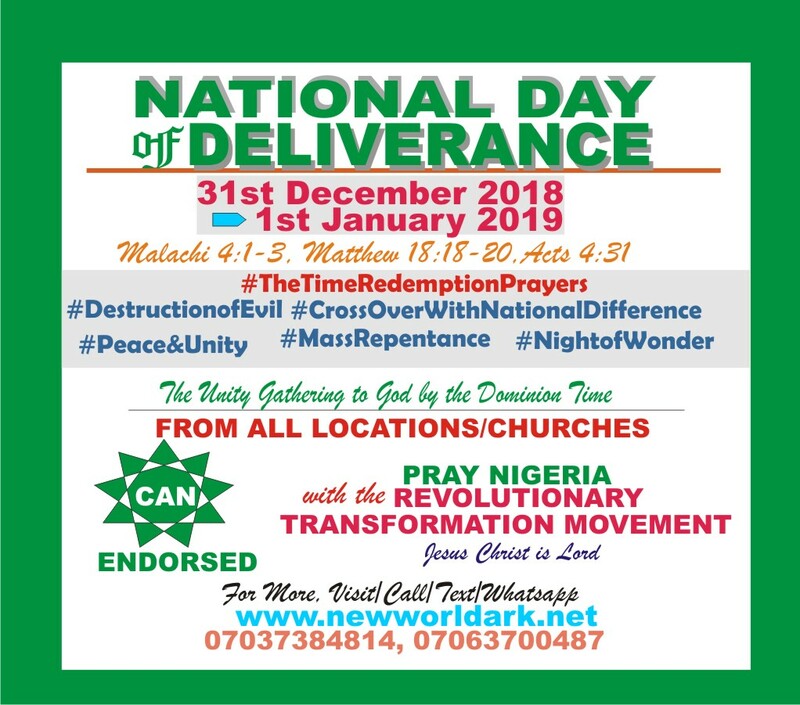 Whoever you are, bet me you need the favour and intervention of God daily and to escape the daily calamities of the times and to see the National Day of Divine Intervention in the glory of God. Therefore I will advise you to pray daily by the time; i.e using The TIME REDEMPTION. Apart from the fact that IT IS THE MOST REVERED UNITY OF THE FAITH, it is God’s dominion and divine intervention system for mankind. You should constantly use the time especially the night for daily devotion and you will be amazed of God’s favour to you every day. It should be no news that those who obey the principle of greatness shall be great. Your first responsibility is to know about this, the second is to share it and then the third is to obey the instruction of the Time Redemption. Subsequently, we may need to discuss more on this by the grace of God. But begin to test the Time Redemption prayer unto that day and your miraculous life has just begun or it shall be extended beyond boundaries. 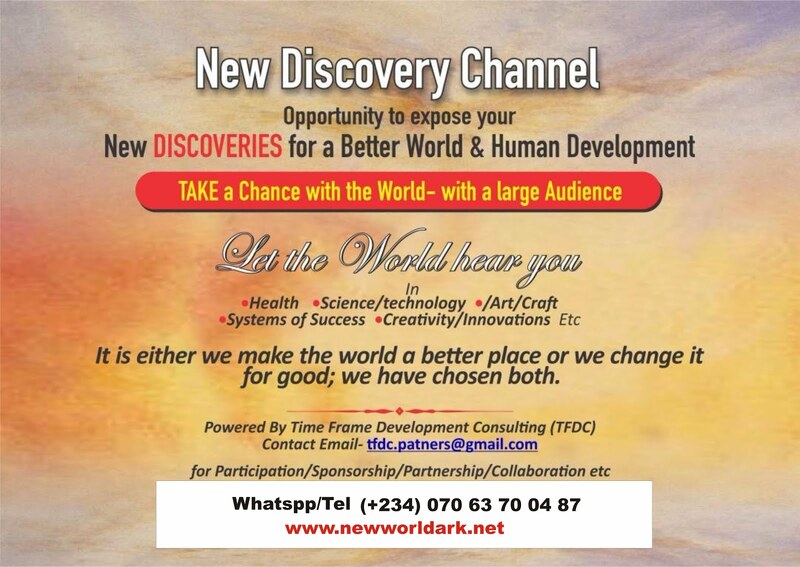 No Let us focus on and survive unto the National Day of Divine Intervention to begin the new round of exploit. Beloved- people are dying recklessly against the will of God for their lives and I don’t want that to happen to any of you and those listening to me. 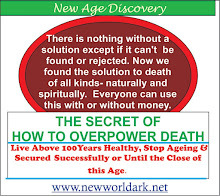 A record of over 150,000 die daily officially record and 90% of these people never plan to die at all. I have now shown you the way not to make void the great of God in you and the revelation of power of death by the Time Redemption Prayer. Beloved, I believe I will have more time to discuss this issue with you after the National Day of Divine Intervention for a glorious end time manifestation of the power of God in you. We have dominion but they is a way to exercise it by the Time Redemption prayer as being revealed. Beloved, it is time to obey God by the revelation of the Word against some logical or church doctrines. Do not let anything or anyone under the guide of unbelief, doubt, sabi sabi or I-don’t-care attitude of others to stop you from obeying this in good faith. And don’t stop yourself either. 1. It is true that the people who really know their God shall be strong; they shall obey Him and do exploits. Therefore, the Lord does nothing except it is first revealed unto His servants for them to obey unto His glory and salvation. He is revealing this to you now. 2. It is also true that the just shall live by fait and should draws back. But we are not of them who draw back unto perdition; but we are of them that believe to the saving of the soul. Praise God…..Halleluiah. The book for Ezekiel 14:12-23 describes a time or situation where all people or adults should stand for their lives in judgment on earth. God says at such times or day that even the righteousness of Daniel, Noah and Job may not save their own children. Beloved, I belt you the National Day of Divine Intervention and Judgment Against Evil in Nigeria is such a time and day or situation. Stand- and let everyone stand. Believers often say this to themselves that: 'you should just believe and it is done and you don't need to do anything about it'. Whatever God says to you; promises you or reveals to you has your responsibility attached. Even if it is for you to believe that Jesus was and will be (died and was raised to life as Lord), you should do this (confess Him as Lord and live after His ways or teachings). The Virgin Mary knew that a virgin could give birth to a Brand New Son as written in the Books. She did this: (kept herself, worked towards it and accepted the offer at the right time). Beloved, I say you will be great and lead Nigeria and Nigeria shall lead the world. And I am telling you what to do in respect to that revelation and instruction of God. 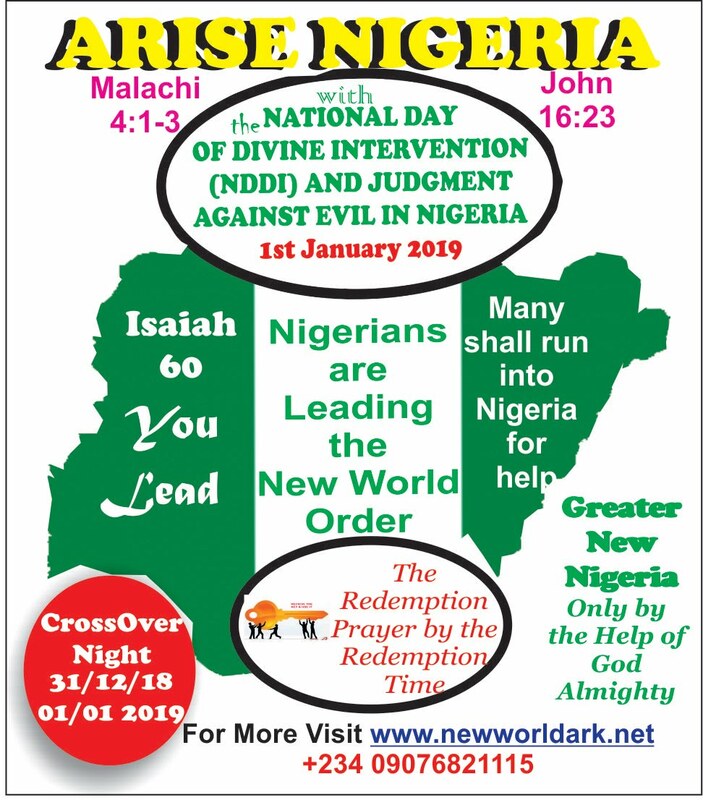 To believe this and not only to nod your head in acceptance and not only to shout 'i receive'; what you should do is to work toward it by using the Time Redemption Prayer in Unity of the Faith and in the order of the National Day of Divine Intervention and Judgment against Evil in Nigeria. The National Day of Divine Intervention and Judgment Against Evil in Nigeria is coming with the force of faith, fire and fury. The force of faith is not physical fight or struggle but obedience to God's instruction with sacrifices. Let us take it by the force of faith because before and now people are still forcing their way into the kingdom of God to order success and exercise dominion. That is how and why our warfare is not carnal but mighty in God in pulling down evil and their master planners. Also, I hope you know that a one days Time Redemption Prayer in unity by the Israelites effectively kick started their deliverance for forty years with all kinds of provisions, protection and guidance of God unto the Promised Land. 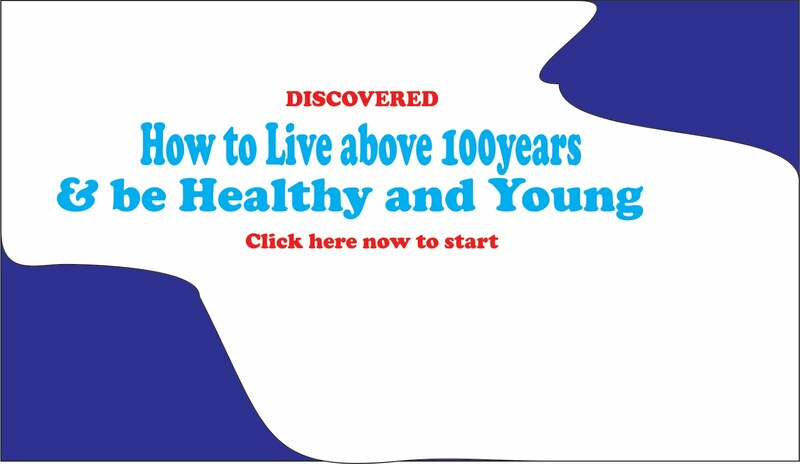 You should know that one instruction of God could handle many years of tolling or wastage. The fact is that by this revelation, we have cut a big fish waiting to be dissected and consumed. Just as darkness does not disappear except by the force of light so also evil does not stop except it is stopped with divine intervention force of faith works. Now we are sure of work of faith- the Time Redemption Prayer; we know our role and the day and it is coming. Everyone all peace loving people irrespective of religion or country in the love of God can connect to this revelation and the National Day of Divine intervention and Judgment Against Evil in Nigeria from all the locations or homes/rooms without hindrance or harassment from anyone by the time revealed and as instructed. There is no barrier of location, profession, religion except unbelief. And all you need with you family is to use the Time Redemption Prayer wherever you may be. 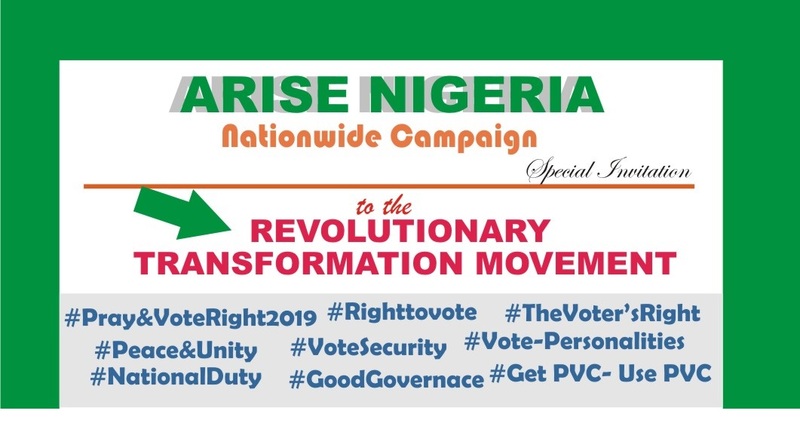 ARISE NIGERIA! 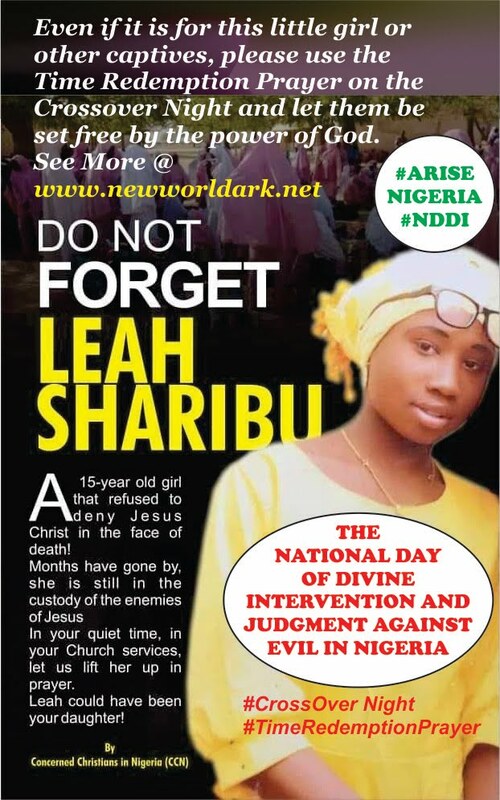 The National Day of Divine Intervention and Judgment Against Evil in Nigeria is real and nothing can stop it. And you should not stop God glory or work in your life by disobedience. I have said it before that this message is for all peace loving Nigerians. The day is coming; no devil can stop it but you can stop it in your life by refusing to obey the Time Redemption Pray instruction. I hope you will comply to the glory of God and for the destruction of evil with the triumph of the righteous. I demand that you listen to this message again over and over again for at least seven (7) times. They are some revelations you need to catch. Play it while you sleep- and keep advancing on it check on the scripture listed or revealed. 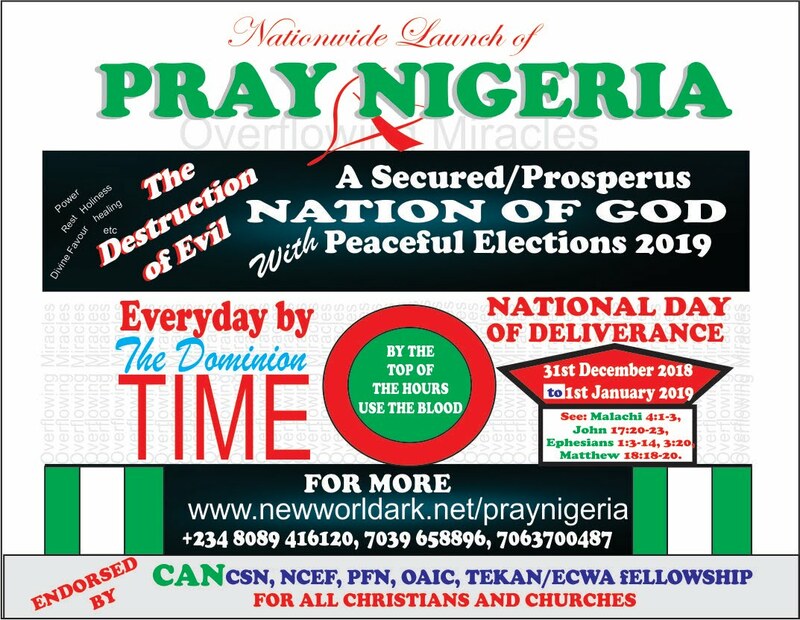 The message is endorsed by and partnership with the Christian Association of Nigeria (CAN) and other religious bodies who have been duly certified accordingly with the revelation of God as regards the National Day of Divine Intervention and using the Time Redemption Prayer. 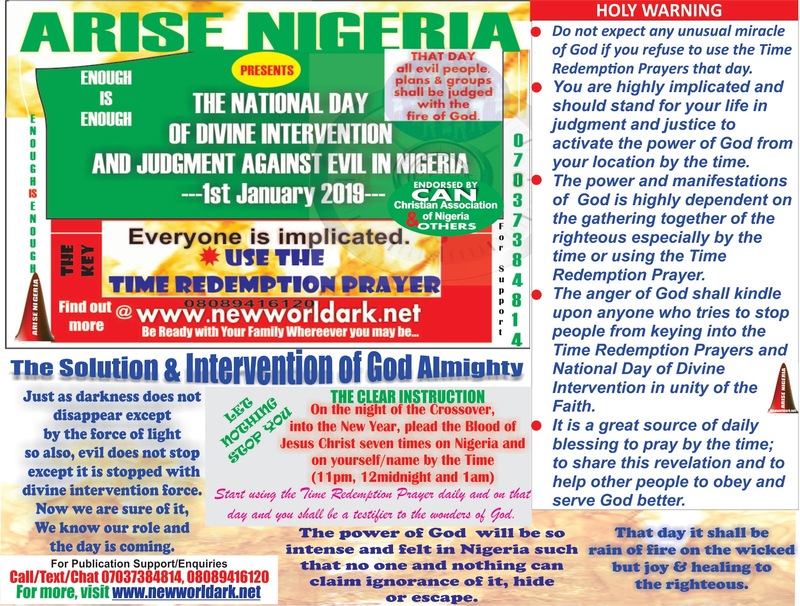 You may get a nationwide circular in your churches over the Time Redemption Prayer and the National Day of Divine Intervention and Judgment Against Evil in Nigeria from the Christians Association of Nigeria but if not and for the exigencies of time, take this as the circular. “Your family will hold you responsible if they do not hear this from you and so is your church and colleagues- there is no barrier to the glory of God. Your third responsibility is to share and tell others about this in the way you can. Just as darkness does not disappear except by the force of light so also evil does not stop except it is stopped with divine intervention through the force of faith works. Now we are sure of it the day, the faith instruction, we know our role and the day is coming. God shall not arise but we should arise to the light of God by this revelation. My name is IJIGBAN DANIEL OKETA. If it is not God who sent me with this then let me be judged for evil today and on that day. If this is a liar against God and His word then- let me not survive the wrath of God today and on that day. I have not asked you for your silver or for your gold for have passed on the message of God for you to obey. Call the numbers on the leaflet/banners/website if you need more enquiries, support or assistance. 1. Please Share, Please Share this message through the media and/or get this tape for others- friends/family/colleagues etc; have them listen to it by all means. 2. 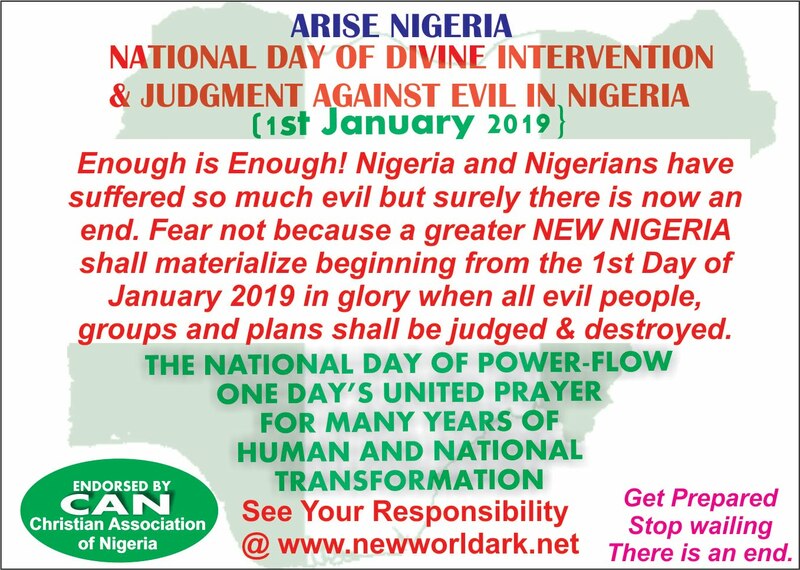 The Day is at hand and let every peace loving person hear about the National Day of Divine Intervention and Judgment against Evil in Nigeria and what they should do to stand for their lives in the justice and judgment of God. 3. It shall be a great day; like never before and like it should ever be.